In an age where, instead of looking out the window, you can quickly look at the radar map on the Internet to find out if it’s raining, one might think that unique weathervanes serve no real practical purpose. While it is true that unique weathervanes occupied an important place in history, most of today’s rooftop and garden weathervanes are installed primarily more for aesthetic purposes. It is not uncommon to see unique weathervanes posted on garages, barns, and other structures like sheds and dollhouses. That said, weathervanes remain both functional and beautiful, and even if they are rarely used as they were traditionally, they are still well-loved architectural features. Unique weathervanes date back to ancient Greece and were regularly used well into the 20th century by farmers and others who worked outdoors. Generations of children grew up learning how to “read” the weather based on the sky conditions and the direction and strength of the wind. Weathervanes aided in planting and harvesting and imparted useful information to those skilled in reading current conditions and predicting weather. This information directly affected the safety of people on land or at sea. Weathervanes are still quite popular additions to cupolas, even on brand new houses. 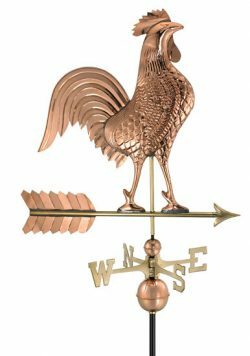 Modern weathervane designs range from the traditional rooster weathervane and horse weathervane to whimsical designs that include mermaids, lighthouses, tools, and locomotive train weathervanes. Whitewall weathervanes are a highly respected brand in this area of home and garden accessories, incorporating dozens of custom and unique weathervane designs. All weathervanes are made so that weight is distributed evenly on each side of the center rod, even though the surface area itself may be unevenly distributed. Essentially the side with the larger surface area is the one blown by the wind resulting in the weathervane pointer being positioned on the side with the smaller surface. Most weathervanes have directional markers fixed below the arrow, corresponding to the geographical directions of North, South, East, and West. Weathervanes are still loved, appreciated, and sought after and continue to be added to new homes and structures by designers and homeowners who can appreciate their unique place in architectural and human history. It’s not uncommon to find homes in urban centers with unique farm animal weathervanes installed on their roofs and garages including rooster, pig, cow, and horse weathervanes. The vast majority of people who install weathervanes today do so not for their meteorological utility, but for their architectural beauty. That’s why garden weathervanes have grown in popularity. Themed garden weathervanes should be oriented to still take advantage of prevailing winds, that way the beauty of a garden weathervane will remain married to its functionality. To work properly, a cupola weathervane or a rooftop weathervane is generally installed quite high off the ground, and away from objects that might interfere with the wind direction. For that reason, many people are surprised when they discover just how large a weathervane has to be to be readable from ground level, especially unique weathervanes that depict people, places, and events in detail. Golfing, lighthouse, and horse and carriage weathervanes are generally quite popular. The addition of a unique weathervane on your home, garage, or shed will show that you have a sense of style and aesthetics, with attention to detail. Learn more about our selection of Copper & Aluminum Cast Weathervanes. 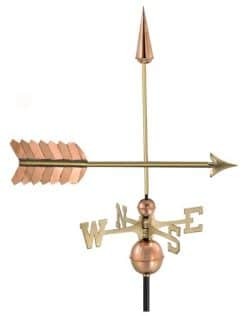 You can buy weathervanes online at The MailboxWorks or for more information about our Good Directions and Whitehall weathervane products please contact us online or call us toll-free at 1-866-717-4943.